Layfield Construction Products is the only company in the business that provides solution-based bundles of geosynthetics and other construction products. Layfield Construction Products always seeks to deliver the right products for each customer’s desired application. We work with distributors and contractors alike in their product selection. We specialize in the delivery of specialty and commodity materials used in the construction and environmental industries. We provide products ranging from geosynthetics, construction film, plastic sheeting, industrial fabrics, and other specialty markets. Layfield has a range of geogrids available to suit all soil reinforcement applications. Geogrids are available from stock in most Layfield locations and most types of geogrids can be purchased by special order. Layfield also provides design services for soil reinforcement applications where we can provide preliminary designs on suitable projects. For over 30 years Layfield has provided tarpaulin and enclosure systems for weather protection in commercial and industrial construction. 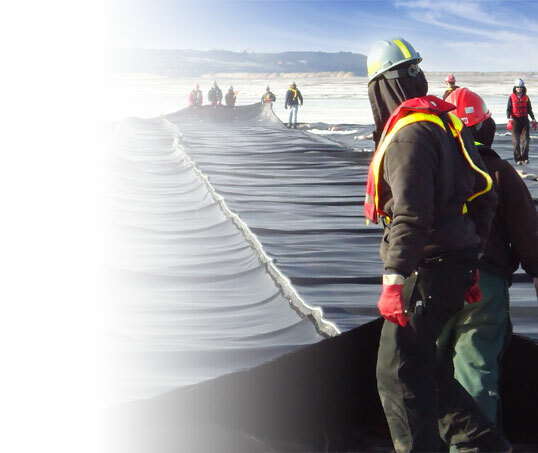 Our fire retardant tarpaulins and specialized hardware are the dominant system for refinery work in Canada. Our WeatherPro brand of enclosure systems use a number of hardware styles to attach to scaffolding, cable, or other structures. Current trends in site development are moving toward advanced storm water management systems. Layfield has a number of products that can assist the site development engineer in controlling storm water. We can assist in the development of storm storage systems used for detention, infiltration, or retention applications. We have products to help create above ground or underground storm water storage systems, permeable paving systems, and storm water channel protection products. information, straight in your inbox.